Filip Jerolinov at Cape4 Yachting sends news of a €200,000 price cut on the 24m Navetta motor yacht Phaedra I, a joint listing with Richard Earp at Fraser Yachts. Built by Benetti Sail Division in 2002, Phaedra I accommodates up to eight guests in three staterooms and twin 379hp MAN engines power her to 10 knots. Her low superstructure and long keel with bulbous bow allow her to be very stable at sea and the hull and superstructure were repainted in 2009/2010. 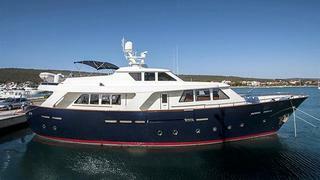 Lying in Croatia, Phaedra I is down from €1.95 million to €1.75 million.